Created in the image of God, man and woman are designed to reflect God’s own nature and being. At the very heart of the Godhead—Father, Son and Spirit—we see the qualities that form the basis of our design as men and women. In the Godhead, there is perfect equality, diversity, unity and order, and it is these characteristics that shape our differences as well. Carrie Sandom, along with a rising tide of like-minded Christians, is concerned about the growth of feminism in our society, our families and our churches—and the detriment this poses to all three. She clearly presents the problem and leads readers along the path to restore God’s design to its rightful place. Just as relationships in the Godhead are equal yet diverse, working together in unity and order, so are these characteristics to be reflected in the way men and women relate to one another. 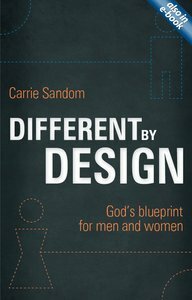 Scripturally grounded, Different by Design presents a biblical context for the roles of men and women in marriage, the church and the workplace, with present-day implications for each. Carrie Sandom is Associate Minister for Women and Pastoral Care at St John Church, Tunbridge Wells, UK. She served in women and student ministry for almost 20 years.